I was taking items to my mom’s recycling bin in her garage when I saw it sitting on the laundry room shelf. After my parents’ relocation to Canada last year, they sorted through some things they had kept from our youth and inquired as to whether we wanted them: The green and orangish chalk drawing from Grade 9 that only a loving parent would frame and graciously hang in their house for a good decade? Uh… that was very sweet, but no thank you. The horse-jumping picture collection? You bet. I’ll take any evidence of my pre-kid glory days to prove to my offspring that I was truly cool once. 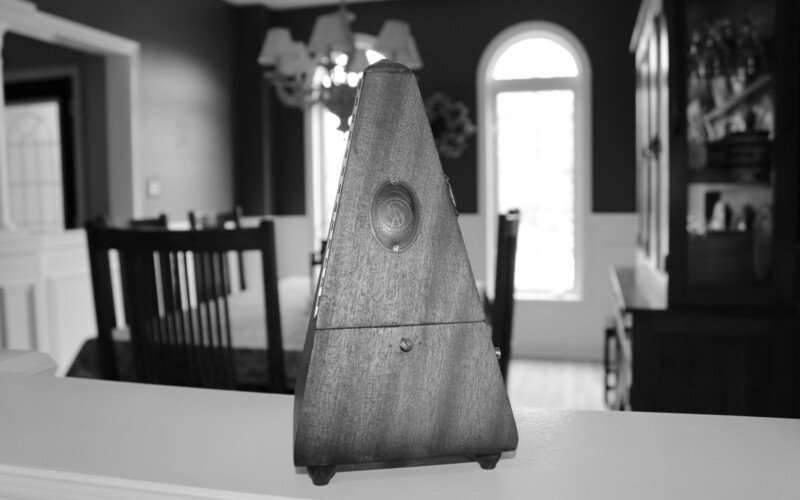 The antique, wooden metronome – our steady companion for over a decade of piano practice? No thank you. Besides, there’s an app for that. So there sat the rejected metronome. On the laundry room shelf – the last stop before the thrift store or the dump. Once I emptied my hands of the recyclables, I came back in and looked it over. I flipped open the triangular wooden door and popped the metal arm out of its holder. As it ticked back and forth with the same hearty rhythm it kept decades ago, it struck me that this uninteresting metronome didn’t make beautiful music. The structure and steadiness of the beat wasn’t a beautiful sound in itself, but for an untrained musician, it organized the sounds of keys and strings into something that was. Without it, the sounds would be irregular and discordant. It struck me. The function of that metronome was perfect imagery for the personal discipline that formed from those years of piano practice and other tasks like it. Doing something hard, day after day, even when I didn’t feel like it wasn’t valuable to me at the time, but the bulk of discipline that accumulated as a result sure is. It now enables me as a woman to persevere in organizing all the beautiful, jumbled pieces of life and family into something harmonious and lovely. So, as natural as it seems to do so, let’s not shy away from tedious tasks that seem useless or mundane. Repetitive tasks, finishing fully and finishing well – even in the small stuff – may seem tiresome at times, but those choices are steadily building into our lives, the prized quality of discipline. Though it may not seem beautiful to us now, someday it will enable much that is. As you can tell, I kept the metronome as a reminder of the value of discipline. As you may be noticing, I’m catching up on your blog! I’m glad I read this one this week, as I’m trying to formulate a blog post on duty–a topic with which I’m wrestling right now. Thank you for this!